After eight films in the Fast & Furious franchise, the series is finally starting to branch out with spinoff movies focusing on popular characters. The first one will feature Dwayne "The Rock" Johnson and Jason Statham's characters teaming up, and now it looks like their followup is coming together. 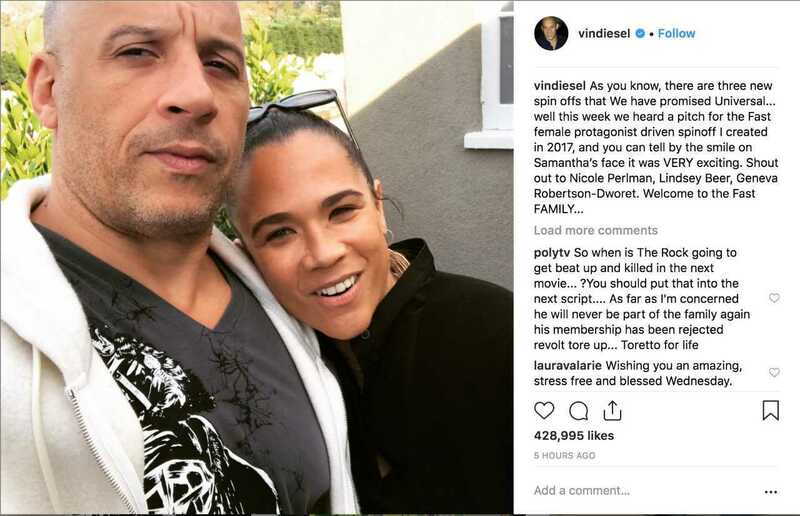 According to Dom Toretto himself, Vin Diesel, the female-led spinoff of the Fast & Furious franchise is getting a boost of talent from some prominent screenwriters who helped craft some popular Marvel Studios movies and many other successful projects. Details about the female-let spinoff are scarce, but they're definitely enlisting some major talent to help craft the adventure. Geneva Robertson-Dworet co-wrote the script for Captain Marvel and was attached to craft the Spider-Man spinoff film Silver & Black before that project was shelved. Nicole Perlman wrote the first Guardians Of The Galaxy film, kicking off the most surprising franchise in the Marvel Cinematic Universe. She also helped develop the story for Captain Marvel and wrote the treatment for the upcoming Black Widow solo film. And Lindsay Beer wrote the Netflix film Sierra Burgess Is a Loser and the Daisy Ridley-Tom Holland film adaptation Chaos Walking. The Fast & Furious franchise is seeing its first tangential expansion this year with Fast & Furious Presents: Hobbs & Shaw, starring Johnson and Statham reprising their roles as the rival officer and criminal. The film will be directed by John Wick and Deadpool 2 director David Leitch, who is using the opportunity to tell a different kind of story in the franchise. "We’re going to go on an exciting ride with these two beloved characters of the franchise who were always at odds," Leitch said to Total Film. "I think of the classics like Lethal Weapon or 48 Hours, or some of these ’80s and ’90s buddy-cop comedies – that dynamic was fostered in the original [Fast] franchise, we’re going to take it and expand the whole world around it." Fast & Furious Presents: Hobbs & Shaw is scheduled to premiere in theaters on August 2nd.